Carnegie Mellon University’s Marlene Behrmann, the George A. and Helen Dunham Cowan Professor of Cognitive Neuroscience and CMU co-director of the Center for the Neural Basis of Cognition (CNBC), has been elected to the National Academy of Sciences (NAS). She is the first female scientist from CMU to be elected to the NAS. Behrmann is among 84 new members and 21 foreign associates from 15 countries to be elected this year to the NAS in recognition of their distinguished and continuing achievements in original research. "Very few researchers make a clear and vivid connection between the brain and the mind. Marlene is one of them. Her pioneering work on how the brains of normal and autistic subjects differ has changed our view of the disease. This is a well deserved honor for Marlene — we are extremely fortunate to have her on our faculty," said Richard Scheines, dean of the Dietrich College of Humanities and Social Sciences. “Marlene is a world-class scholar who richly deserves this singular honor. As both her colleague and long-time collaborator, I personally appreciate her incredible scientific intellect and integrity — to my mind there is no better cognitive neuroscientist in the world today,” said Michael J. Tarr, head of the Department of Psychology in the Dietrich College. Behrmann joined the CMU faculty in 1993 and is widely considered to be one of the foremost experts in the cognitive neuroscience of visual perception. Her research combines behavioral investigations and brain imaging techniques with both normal and impaired individuals to identify the functional architecture of the human brain that enables our visual experiences. For example, she explores the neural mechanisms underlying how we can quickly, and seemingly effortlessly, recognize different people by their face, and how we can learn to categorize and differentiate between different thousands of objects. Behrmann also uses brain imaging to uncover what is happening in the brains of individuals with developmental disorders, such as autism and dyslexia. Her recent work revealed that the brains of individuals with autism display unique neural synchronization patterns, a finding that may facilitate more effective diagnosis and treatment of the disorder. In addition, Behrmann has taken one of the first steps toward deciphering the link between general brain function and the emergent behavioral patterns in autism by demonstrating that autistic adults have unreliable sensory responses to visual, auditory and somatosensory stimuli. Behrmann co-directs the CNBC, a joint center between CMU and the University of Pittsburgh devoted to investigating the neural mechanisms that give rise to human cognitive abilities. The CNBC integrates the basic and clinical neurosciences with cognitive and computational sciences across the two universities and sponsors a highly successful interdisciplinary graduate training program. Behrmann has authored more than 200 articles and chapters and has edited three books. She is a fellow of the American Psychological Society, the International Neuropsychological Symposium (INS) and the Society for Experimental Psychologists, and has been a member of many editorial boards including the journals Psychological Review and Psychological Science. Her professional service includes roles in the INS and the Society for Neuroscience, and she has served on review panels for the National Institutes of Health, National Science Foundation, the Binational Science Foundation and Israel Science Foundation, among others. 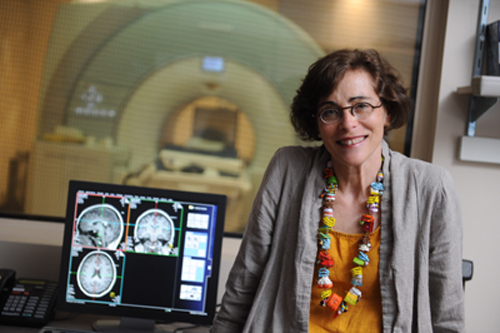 Behrmann has received many awards for her numerous scientific contributions, including the Presidential Early Career Award for Engineering and Science, the American Psychological Association Distinguished Scientific Career Award for Early Career Contributions and the Early Career Award in Neuropsychology. She received her bachelor's and master's degrees in speech pathology from the University of Witwatersrand, Johannesburg, South Africa, and a doctorate in psychology from the University of Toronto. Behrmann’s pioneering work and leadership are two examples of why CMU has been a world leader in brain research for more than 50 years. As the birthplace of artificial intelligence and cognitive psychology, CMU has created some of the first cognitive tutors, helped to develop the Jeopardy-winning Watson, founded a groundbreaking doctoral program in neural computation, and completed cutting-edge work in understanding the genetics of autism. Building on its strengths in biology, computer science, psychology, statistics and engineering, CMU recently launched BrainHubSM, a global initiative that focuses on how the structure and activity of the brain give rise to complex behaviors. Behrmann is the 14th CMU faculty member to be elected to the NAS. Within the Dietrich College, Behrmann joins NAS members John R. Anderson, the R.K. Mellon University Professor of Psychology and Computer Science, and Stephen E. Fienberg, the Maurice Falk University Professor of Statistics and Social Science. Michael Tarr says Marlene Behrmann (pictured above) is a world-class scholar and best cognitive neuroscientist in the world today. Photo courtesy of Trib Total Media.